Dubomedy Arts School proudly announces their Winter Term! Please see the detailed schedule below. For more info about classes, affordable fees and our highly qualified team of teachers feel free to email us: LOL@vivadubai.com. All classes will end with a final performance. January 28- March 17, 2012. Please note students will have off for EID holiday. This class will teach students all the basics of speaking Arabic in the Emirati dialect. Classes include weekly assignments as well as information about local traditions. “From the Page to the Stage” returns for Season 4 with an exciting new line-up of guest teachers. This course will focus on writing for performance: “Sketches, Shorts and Songs!” 2 weeks of comedy sketches, 2 weeks of short play and movie scripting, 2 weeks of performance and acting skills. Students will end this course with a final public reading of the work culminated during the workshop. Our famed Wednesday night Improv Classes will resume on Wednesday, January 25. This course is open to those who already have some improv experience or have graduated from our Comedy 101 course. This high energy fun filled improv class is training for our Improv Revolution Professional Troupe! 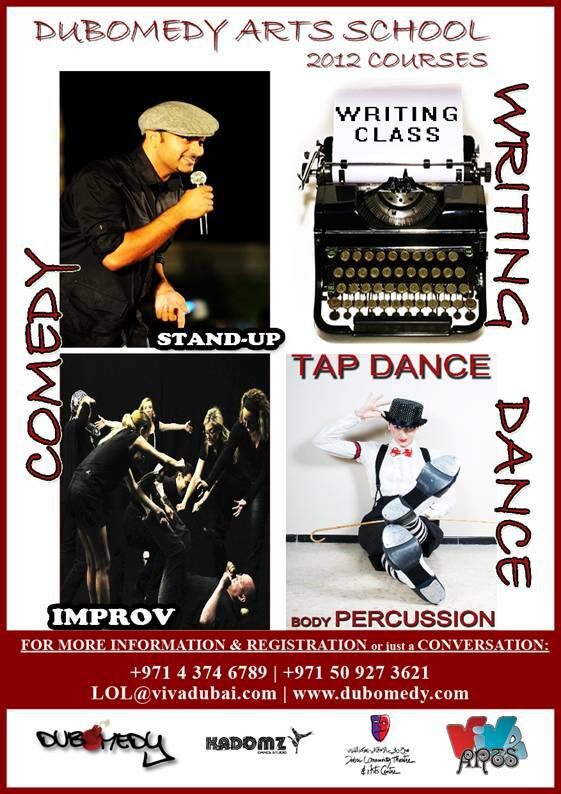 This course will end with a final all improv show at DUCTAC on Sat, March 17. Wednesdays, 7:30-9:00pm- Wednesday Night Improv! This intensive is for intermediate-advanced level students who have had prior acting experience. This is an on-camera class focusing on Sketch Comedy Acting, character development and performance. The students’ final filmed sketches will be aired on Sketch@ TV- the new HUB for Sketch Comedy in the Middle east. REGISTRATION: All Classes will be listed soon at www.ticketingco.com for online registration. We will also hold open registrations in the DUCTAC Lobby every Saturday in January from 2-3pm. To secure your place please send an e-mail to LOL@vivadubai.com with your name, contact info and which class/es you will be attending. Space is limited.